Oil on panel transferred to canvas. The Sacra conversazione is a composition in which the Virgin and Child are surrounded by saints of different historical eras, and on occasions, by donors (as in the present example). The kneeling figure leaning towards the Virgin, who draws the Christ Child’s attention to him, has been tentatively identified as Francesco Priuli. Priuli was one of Palma Vecchio’s patrons in Venice and was Procurator of the Republic in 1522. This painting has been identified as the one mentioned by Francesco Sansovino in his guide to Venice published in 1581, entitled Venezia Città Nobilissima, in the section on the palazzo Priuli. In the 17th century it would appear that Marina Priuli gave the painting to the Venetian Senate, according to information published by Marco Boschini in 1664 in another guidebook on the city’s paintings. In 1656 she wrote her will, mentioning the intended destination of the painting, which was given to the Senate following her death in 1661. The painting was hung over one of the doors in the Hall of the Council of Ten. In 1808 it belonged to Napoleon’s stepson, Eugène de Beauharnais, and is recorded in an inventory of that year. The painting passed through various generations of the family until it was acquired for the Thyssen-Bornemisza collection. We also have information regarding two early restorations by Pietro Edwards: one was paid for on 3 October 1795 and the other in 1806, for which various documents survive. This Sacra conversazione has been dated to around 1518–20, partly on the basis that it must have been painted before Francesco Priuli was appointed Procurator of the Republic. Had he already been Procurator, he would have been painted in the red robe of office, rather than the black that he wears here. The work falls within Palma’s mature period, although we can still detect features that recall his earliest works, such as the hands and sleeves of Saint Catherine, which resemble those of Mary Magdalen in The Flight into Egypt in the Uffizi. 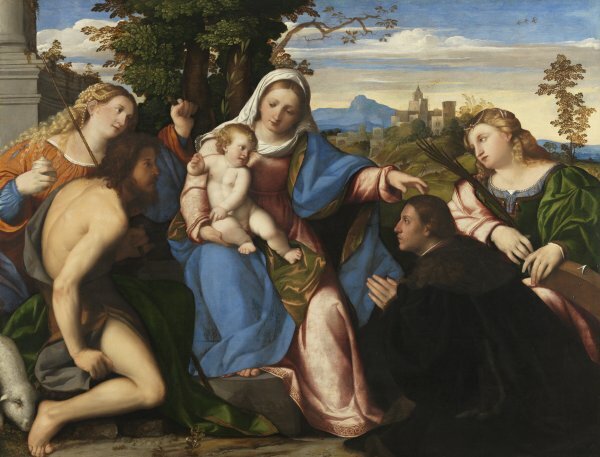 Palma organised the present composition around his monumental presentation of the Virgin and Child, who are surrounded by four judiciously placed figures set on slightly different planes around the central group. Rylands drew attention to the two figures on the left. He noted that the poses of Mary Magdalen, identifiable by her pot of balm, and Saint John the Baptist with the lamb, cross and hair shirt are inspired by those of Averroës and Pythagoras in Raphael’s School of Athens. Within Palma’s oeuvre, the Sacra conversazione was one of the most frequent subjects. This fact, combined with the evident stylistic evolution within these works, has made it possible to establish a relatively exact chronology for this part of his oeuvre, starting from around 1510 with the examples now in the Gemäldegalerie, Dresden, and concluding in 1528, the date of the artist’s death and of the composition in the Accademia, Venice.